The Tesoros 'Uraba' bicolor are here! P. bicolor originates from Colombia. The bicolor is a mid-sized frog that does well in groups. The bicolor are a bold and colorful frog with a beautiful trilling call. Like their slightly larger relatives the terribilis, they are aggressive feeders and will tackle prey much larger than the typical dart frog (anything they can physically subdue in fact!). 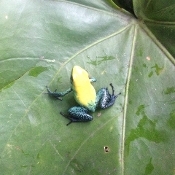 The Tesoros 'Uraba' bicolor originate from the upper San Juan River Basin and are generally yellow with blueish or greenish legs. In some cases, blue can be found on the sides of the frogs too. Some mature animals have shown a deeper orange coloration along the back as well. The 'Uraba' bicolor show a good deal of variability in coloration. However, all variations are stunning to see in person! These frogs are strong jumpers and can be a bit flightly as juveniles. Once mature, they tend to relax and become much more subdued - similar to P. terribilis. We recommend keeping them in groups of 4-6 in a 40-50 gallon size tank. Frogs offered are captive bred sub-adults unless otherwise noted.